Going beyond where Michael Chekhov left off, this book presents acting as a mind, body and spirit practice and actors as emotional athletes, spiritual stuntmen and stuntwomen exposed to a constant roller coaster of emotions. Emmanuelle Chaulet, international film actress and artists coach, develops her own acting technique ENERGIZETM using discoveries from holistic and energy healing modalities and breaking new ground in the performing arts field. 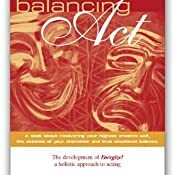 Answering an urgent -yet never addressed- need, this book offers invaluable tools to balance life and acting, heal post-performance stress disorder and performance anxiety. You'll find cutting edge information about recovering your Highest Creative Self, the essence of your character, and true emotional balance. Foreword is written by Lisa Dalton, co-founder National Michael Chekhov Association. Going beyond where Michael Chekhov left off, this book presents acting as a mind, body and spirit practice and actors as emotional athletes, spiritual stuntmen and stuntwomen exposed to a constant roller coaster of emotions. 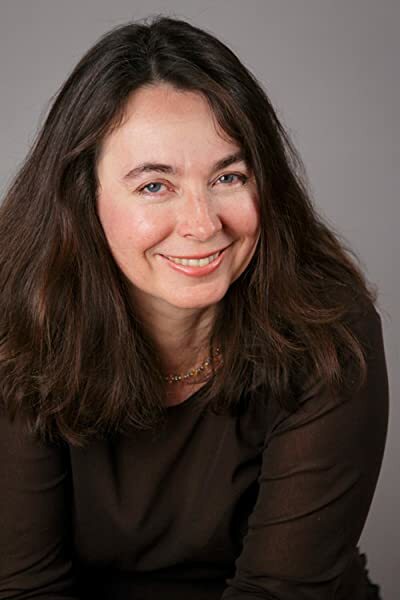 Emmanuelle Chaulet, international film actress and artists coach, develops her own acting technique ENERGIZE™ using discoveries from holistic and energy healing modalities and breaking new ground in the performing arts field. Answering an urgent —yet never addressed— need, this book offers invaluable tools to balance life and acting, heal post-performance stress disorder and performance anxiety. You’ll find cutting edge information about recovering your Highest Creative Self, the essence of your character, and true emotional balance. Foreword is written by Lisa Dalton, co-founder National Michael Chekhov Association. 5.0 out of 5 starsA wonderful holistic resource for actors and presenters. This book has helped my presentation skills as a corporate trainer. The toolbox Mme. Chaulet presents is versatile not only to actors, but to anyone who is required to perform/present to an audience. This book was ahead of it's time in Mindfulness training. Would reccomend to anyone looking to connect with their audience. As we see many actors going through painful detox, rehab or addictions, A Balancing Act is THE book that could save many of them. Actors are very sentitive to energy, they have strong feeelings about things. When i decided to become an actor, i wanted to explore this craft with the same approach that we can find in martial arts or a spiritual journey. I know many actors who are struggling in their daily life. We are very sensitive and the exercices that we have to do to be more open and vulnerable can often lead us to some kind of chaos. We have a lot of insecurities that come from our lifestyle and from our psychology. We dig into our subconscious and sometimes we have big troubles to come out. A Balancing act is a great book for actors who want to find more balance in their art and life. It explains the energy system of every human being with clarity and it shows how every actor can find balance through simples exercices that are meant to support their craft. It is a revolutionnary book that can save many lives. 5.0 out of 5 starsA well-written guide to an innovative acting approach! As a former student of the author, I am excited that the Energize approach has been so thoroughly laid out in this book. I was lucky to have been a part of the evolution of this technique, which I still use in my acting work. It was a revelation to me that these energy systems exist, and that the emotions I experience as a character color my energy systems, and remain when I'm off-stage. It explained so much! Now I utilize techniques outlined in this book to separate myself from characters when rehearsal is over. From Emmanuelle and this book, I've learned the importance of a healthy life for an actor, because the more I maintain balance, the longer I can practice my art without riding emotional roller-coasters and burning out. And that's just the tip of the iceberg! If you're on the lookout for a new acting system, read this book. In A Balancing Act, F. Emmanuelle Chaulet clearly and effectively describes her holistic system of combining acting techniques with work on the energetic system within the body. She has been using this approach, which she calls "Energize!" for about twenty years as a teacher working with students; as a director working with actors; and as an actor working on herself. She focuses on the Strasberg [and Michael Chekhov] technique[s] of acting, so actors trained in this technique would be the most likely to respond to the vocabulary she uses and to the exercises she proposes. As a young actress, Chaulet found that the techniques she was using left her unable to let go of the darker sides of the characters she was portraying, creating an unhealthy imbalance in her life. She discovered that by applying work on the energetic systems to her acting she could approach her craft from a healthier angle. The title of the book refers to balancing all aspects of one's life and art, including the polarities within the human body, the use of varying acting and movement techniques, and finding balance between one's life on and offstage. 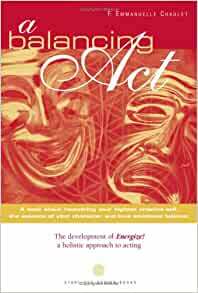 Through simple and precise descriptions of exercises related to acting, energy, and a combination of the two, Chaulet has written a useful and comprehensive book on acting. The book is essentially divided into four sections. First, there is a brief autobiographical section, focusing on Chaulet's life as a young actress in France and as a student at the Lee Strasberg Institute in New York City. Here she describes her problems with the techniques she was studying, and how she came to polarity therapy as a way to deal with the imbalances these techniques had left in her life. In the next section she describes in detail the energy systems working within the body, and how they affect one's emotions and daily life. She illustrates how important it is to clear the energy system to create room for positive artistic energy, and provides many exercises on how to do this. In the next few chapters she describes how to use her system in combination with different acting techniques, and these chapters make up the bulk of the book. Using a vocabulary that will be familiar to most actors, she describes many exercises in their pure form, and then adjusts them to her system. She starts with the "outside-in" and "inside-out" approaches to finding characters; then discusses the importance of movement to finding characters and objectives; moves on to using her system to clear actors' blocks such as stage fright and expectations; and finally has a whole chapter dedicated to playing real-life characters. The last section of the book is about letting go of characters after the run of a show and finding balance in one's day to day life. Structurally, the book is simple and comprehensive. It is broken up into chapters which are further divided into many small sections, though there is no division between sections and subsections. This can be somewhat confusing. For example, exercises on a particular technique seem to hold the same weight as the description of the technique itself, where there should be some distinction. But other than that, I found the book easy to follow. Chaulet cites diagrams and illustrations when discussing abstract energy systems, making it easy to cross reference her descriptions of colors, lights, images and energy flows with a tangible image. She includes appendices with step by step instructions of the long and short form of the exercises she discusses, lists of action verbs, and various resources for different forms of energy therapy, wellness centers, and acting schools that use energy work. For a book that begins with an apology to the reader for "stylistic peculiarities that will surprise an American reader," I was in fact surprised at the clarity with which the Energize! technique was presented. Whether or not the idea of energy and chakras resonates with you, this book presents effective acting tools. Her language is clear and precise, and the vocabulary she uses will be familiar to most actors. Many of the exercises that I learned in grad school and found very effective are presented here in new ways, and described clearly in step by step form. Furthermore, her explanations of the chakras and energy systems are tangible and never come off as ephemeral or wishy-washy. I found her take on some Strasberg and Chekhov exercises fresh and exciting, and some of her original exercises strike me as very useful. She seems to have found healthy and innovative ways of approaching a technique that can be emotionally draining and sometimes harmful. And although some background in energy and visualization work would help to understand some of the theories she explores, she writes simply and elegantly, and any actor with an interest in polarity therapy and the energetic system would find this book very interesting and useful. 5.0 out of 5 starsA Must-Read For All Artistic Minds! Emmanuelle Chaulet's "A Balancing Act", though geared mostly towards the actor, is a necessary text for all artists. Chaulet's approach to explaining why we go in and out of balance with our lives and the many roles we play reminds us of why we practice our craft in the first place: It is our very human desire to find an interconnectedness and balance between ourselves and the world around us. But actors seek additional connectedness in the world through channeling other characters, which can lead to emotional and spiritual injury. This book provides the reassurance necessary to re-energize the actor that is so easily overloaded by experiences of unhealthy artistic practice. This book stops the artist in his or her tracks to start back at the beginning with a lesson on the well being of the individual. Chaulet guides the reader through a thorough and detailed explanation of the energetic system and its tremendous role as the powerhouse of the actor. In addition to this complete guide to the energetic system are wonderful stories of her own experiences as a working stage and film actress, and as a mother, daughter and wife. Chaulet takes on the role of the gentle and reassuring teacher in this book, encouraging us to clean up the energy we put out and filter the energy we take in, so that we can create a free-flowing connection with the world that is strong, healthy, and sustainable. A quick and refreshing read, this book vibrates with the passion and care that Chaulet encourages us to create from our own energetic centers. It was over before I was ready to let go!